This sounds super interesting. Sounds like this game is going to go really deep into the animal-human type people in the game's world and the politics and injustices that go with it. Instead of just having animal/human characters in the world alongside regular humans with no explanation, sounds like they're not being explained as created "hybrids", and that the game explores that more. In that video, Ancel says "Hybrids have been created to do dangerous tasks that no human would want to do", and keeps talking about slavery, having masters, etc. There's also a lot of exploration around concepts of religion to the characters, especially the hybrids. These are pretty mature topics, I'm excited to see what they do with that stuff in the story. 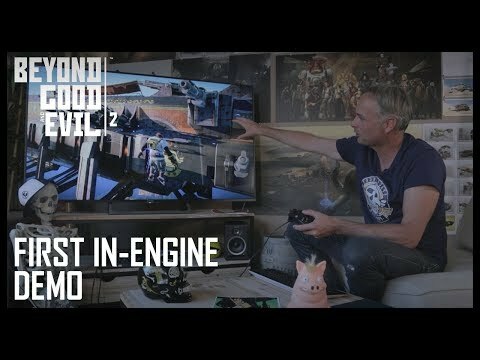 Ancel confirms some partial destructible environments in the game. Also space exploration and multiple planets. As well as multiple space ships you can have with a crew inside. Holy cow. The two presenters are referring to the woman that helps the monkey escape as "Shauni", unless I'm mis-hearing them. If you've played the first game, you know the significance of that. There are mentions of online multiplayer. That's the only thing that causes me to hesitate so far about this game. Online is kind of the last thing I want out of a Beyond Good and Evil game, but ultimately it depends on how it's implemented. Co-op might be cool. They won't confirm if the person at the end is Jade, but they talk a lot about the color of her eyes and that significance. Whoa. 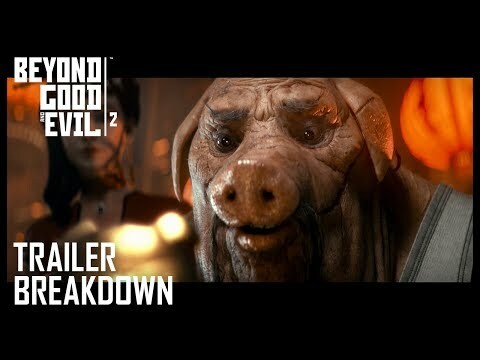 I missed this part because I was freaking out over that trailer reveal, but apparently BGE2 is going to be a prequel? hrm. “Welcome to System 3,” said Gabrielle Shrager, narrative director at Ubisoft Montpellier, where the game is being made. “Our story takes place before the birth of Jade in a multi-ethnic, multi-cultural human society in a distant solar system. It is a time when corporations create hybrids in their labs and enslave them to colonize the stars in order to compete for power and cosmic resources." I don't even have any words left to say here. Bobby knows how much this means to me. My son called me, like on the phone (which he never, ever, ever does) to ask me if I had seen the trailer. They know. They know. The world-building in this game universe is fantastic. Missed this because it dropped in the middle of expo. Here's the full 15 minute behind closed doors presentation Ubisoft showed at E3. It's a game engine demonstration running in real time. This engine is pretty incredible, and the scalability is mind blowing. It's a good starting point. I'm anxious to see the movement and combat mechanics implemented in this.